Some of those diagnosed with alcoholism or substance abuse also suffer from a mental condition, and doctors refer to these patients as those with a dual-diagnosis1. Having a mental disorder can affect the way you receive treatment for your addiction because the doctor must treat both conditions at the same time. For this reason, it’s important to seek out a dual diagnosis treatment program when you begin your rehab search. Dual-diagnosis recovery centers treat those struggling with a mental disorder and a substance addiction. Addictions to prescription medications, illegal drugs, or alcohol can negatively impact people’s mental health. Those suffering from schizophrenia, depression, anxiety disorders or personality disorders are about twice as likely to use and abuse drugs and alcohol and vice versa 4. The U.S. National Library of Medicine found that some users might start abusing drugs or alcohol because the substance reduces their symptoms, while others suffer from mental problems due to their substance use. If a person receives treatment for one disorder but not the other, they are more likely to relapse. For example, if someone receives treatment for alcoholism but has an anxiety disorder that goes untreated, they may begin to drink again when something triggers their anxiety. In many cases, the drugs or alcohol help the person numb or mask the symptoms of a mental health disorder. When they go off drugs or stop drinking, the symptoms of the psychiatric problem may resurface. You might suspect that you or your loved one has a dual diagnosis, but aren’t sure. Below are some symptoms you can look for to determine whether you need treatment. Avoiding friends and social activities. When you begin searching for dual-diagnosis rehab facilities, you’ll find that doctors recommend a variety of treatment. The doctor will look at the circumstances surrounding the addiction to determine what needs treated first. Your doctor might suggest treating your mental disorder first, while another patient might receive treatment for the disorder second. The type of treatment often depends on whether you suffered from the mental condition or addiction first, but either way, a comprehensive treatment plan must be put in place in order to fully address the patient’s needs and reduce the risk of relapse. This treatment plan should be regularly evaluated and adjusted, if necessary. Sometimes a doctor might prescribe a medication that doesn’t work and need to switch to something else. Nearly 9 million adults suffer from both a substance addiction and a mental health condition. In order for dual diagnosis treatment to be most effective, mental health professionals must screen and assess patients in order to create comprehensive treatment plans designed to treat individualized needs 5. Medication is a potential treatment for a dual-diagnosis, with some medications being approved as ongoing treatment for alcohol and opioid addiction. Other medications used to treat mental health conditions include antidepressants, anxiolytics, and antipsychotics. When you check into a dual-diagnosis recovery center, the doctor will often use medication along with another type of treatment such as therapy. It’s important that you find a facility that not only uses medication to treat the mental disorder but also therapy or another form of treatment for the substance abuse. Behavioral therapies should be used in combination with pharmacotherapy when treating a patient with a dual diagnosis. Cognitive-behavioral therapy teaches you how to adjust your thoughts and behaviors in regards to your condition, while group therapy imparts on how to interact with those around you. Some group therapy sessions also let you share your experiences and talk to others with the same diagnosis. Behavior management is an additional form of therapy that focuses on your behaviors and actions in regards to your substance abuse. Crisis help and interventions are significant when you need to assist someone in your life with a dual-diagnosis. An intervention gives you the chance to sit the person down and discuss the combination of mental disorder and substance abuse, and you can encourage that person to seek treatment by having a doctor on hand. Crisis help can take the form of a dual-diagnosis hotline or helpline that you call when you aren’t sure what to do next. When seeking out a dual diagnosis treatment facility, you need to take into consideration your own needs and the services at the program. Do you want to travel for treatment, or stay close to home? Does the program take your insurance? Can you afford it? Does the program offer payment plans? How much experience does the staff have? What did other people have to say about the program in online reviews? Do you need treatment for medical conditions? What’s the program’s treatment philosophy, and do you agree with it (12-step, evidence-based, religious)? Does it cater to your gender/ethnicity/sexual orientation? Narrowing down what’s important to you in a center, as well as what you can afford, can help you make a more informed decision and lead to a more successful treatment experience. 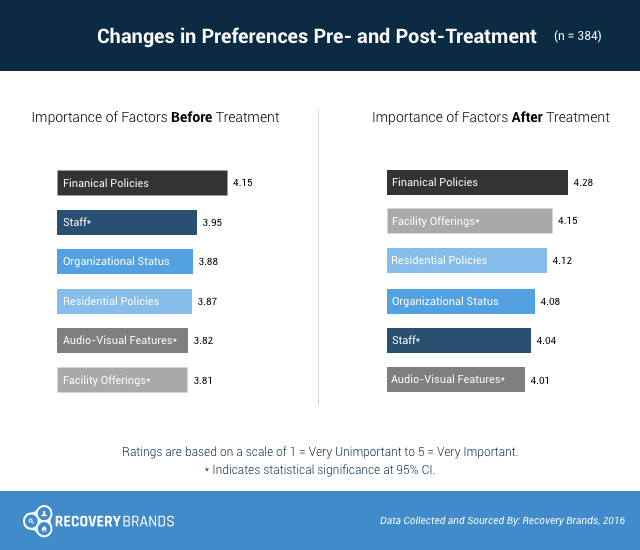 In 2016, Recovery Brands asked patients that were leaving an addiction rehab clinic what attributes they believed to be the most valuable when looking at a program. Their top priority was the program’s financial practices, such as insurance accepted, payment options, and financial support. They also prioritized facility offerings (quality of food, comforts, housing, etc.) significantly more upon leaving treatment. When making a decision, people new to treatment may want to examine a clinic’s financial policies as well as its offerings. Most private insurance plans will cover an assessment. They will usually cover most of the cost of a detox or outpatient program, and partially cover inpatient. It’s best to check with your particular plan to see exactly what’s covered. Medicare covers up to 190 days of inpatient services during your lifetime, with a $1,260 deductible and variable co-payments. It also covers outpatient counseling and therapy and partial hospitalization (you pay a percentage of each service, daily co-payments, and a deductible). Medicaid is run on a state-by-state basis, and each state covers dual diagnosis treatment to different degrees. However, Medicaid will often cover both inpatient and outpatient care, as long as the facility accepts Medicaid. If you don’t have private health insurance or aren’t eligible for public insurance programs, you can apply for coverage through your state’s health insurance marketplace. These plans cover different degrees of inpatient and outpatient mental health and substance abuse treatment, dependent upon the state. Using a crowdfunding site such as GoFundMe. Tapping into a savings account. Applying for a health care credit card (just make sure the interest rate isn’t too high). According to the U.S. Department of Health and Human Services, the best dual-diagnosis recovery facilities are those that offer an integrated approach to treatment. The program shouldn’t use a one-size-fits-all approach where all patients receive the same program. A good dual-diagnosis rehab program will look at each individual patient and decide the type of treatment that each patient needs. The doctor might take into account the type of mental condition that the patient suffers from, the length of the addiction and the type of substance that the person abuses.
. Buckley, P. F. (2007). Dual Diagnosis of Substance Abuse and Severe Mental Illness: The Scope of the Problem. Journal of Dual Diagnosis, 3(2), 59-62. Retrieved February 9, 2016.
. National Alliance on Mental Illness. (2017). Dual Diagnosis.